Up until just a few years ago, Granny was an avid gardener. The yard in front of her cheery yellow mobile home was overflowing with peonies, lilacs, roses, and hydrangeas. And invariably, whenever I would drop in for a cup of tea, that’s where I’d find her – out in flower garden with clippers in hand, fussing and pruning. In a matter of minutes, she’d put together a beautiful bouquet of fragrant stems and put them in a mason jar for me to take home. Some folks may have a green thumb, but Granny has green hands. I don’t know how she does it, but she can coax a leafless Poinsettia back to life and a paltry African Violet into full bloom. I know so because I nearly killed them both before she got her hands on them! Around the perimeter of my home are four hydrangea bushes nearing the end of their summer bloom, all lovingly planted from cuttings that Granny gave me from her yard over the years. 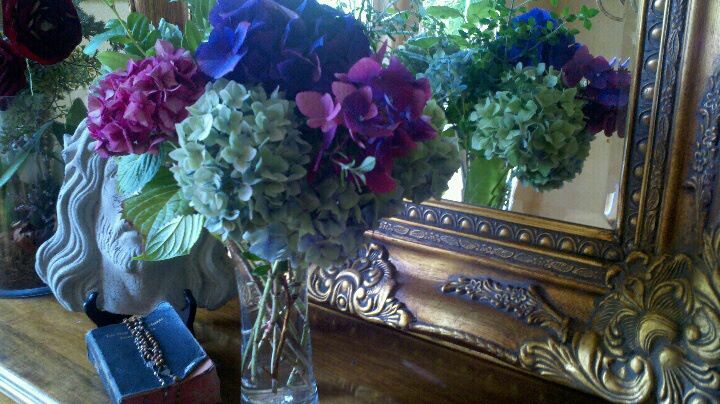 Like her, I love old-fashioned flowers, and hydrangeas are one of my favorites. Yesterday afternoon, I clipped the last of this year’s blooming, arranged them into a bouquet and popped down to the assisted living center where she now lives to surprise her. Her memory isn’t what it was once, and she doesn’t remember growing hydrangeas in her yard, or making cuttings and dipping them in Root Tone before sticking them in a pot of dirt to give to me. But I do. I remember her lessons on how to properly prune a rose bush. I remember the heady fragrance of her French Lilacs. I remember countless cups of tea with toast and honey, plates of fudge, and buttered popcorn popped in oil on top of the stove. I remember macaroni and cheese with a crust of saltine crackers. I remember waltzing around the house as a child in her girdle, and the box of oranges she and Grandpa would send each year from their house on Tico Road. I remember building a fort together and climbing up into it for a picnic. And I remember a shoebox lined with wax paper and filled with Christmas cookies that arrived every December in the mail. She may have forgotten, but I’ll always remember.